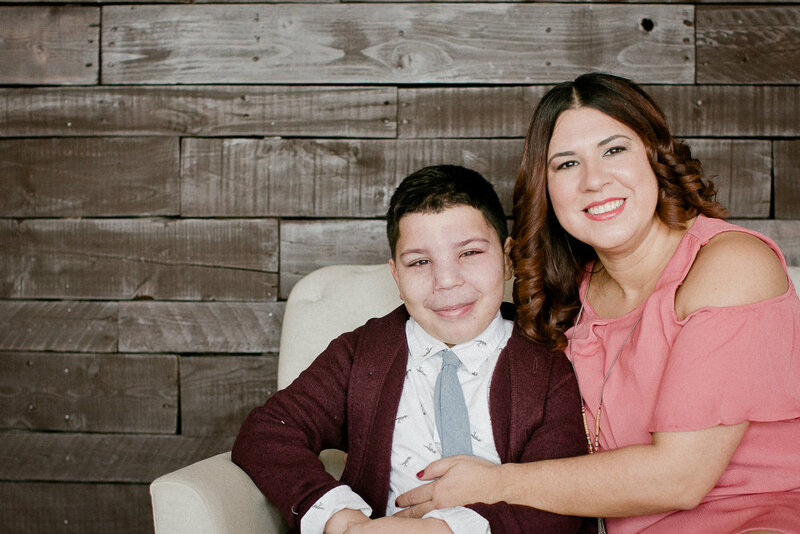 CLICK FOR HOPE | JACOB IS GOD'S DAILY MIRACLE FOR ME. My name is Jazzmine and I am a single parent to my son Jacob. I don’t like the stereotypes of a single mom, because there are so many negative connotations associated with the term “single mother”. I am a mother first and foremost to an amazing child who has Sturge-Weber Syndrome (SWS). SWS is a congenital, non-familiar disorder caused by the GNAQ gene mutation. It is characterized by a congenital facial birthmarks and neurological abnormalities. Other symptoms associated with SWS can include eye, endocrine and organ irregularities, as well as developmental disabilities. Each case of SWS is unique and exhibits the characterizing findings to varying degree. Jacob has SWS, facial Port Wine birthmark, seizures paralysis, glaucoma, developmental delays, murmur, Bicuspid aortic valve (BAV), and auditory processing disorder and sensory disorder. I claim my son’s healing in the name of Jesus. I got pregnant early in my relationship with my son’s father. It seemed like from the moment I found out I was pregnant; everything in my life seemed to fall apart. I lost my house, I had to declare bankruptcy, I instantly became a step mom, “wife” and expectant mother all while everything I worked so hard for was lost. I fell into a depression and it just was not what I imagined becoming a mom should be. When my son was born, he was born with a birthmark on his face. I had a very hard labor and the doctors thought that it might be a bruise caused from me sitting on him. My son truly is an amazing child because of what he endured during the labor. The umbilical cord was wrapped around his neck and his heart kept dropping. This was just the beginning of his challenging life. Jacob had his first MRI at 10 days old. The results showed he had Port Wine Stain. At 6 weeks old he had his first surgery for pyloric stenosis, which means his stomach was not connected to his intestines. It was during the ultrasound that was done to confirm this in Jacob that I knew this was going to happen. At 7 weeks old Jacob had another MRI which was requested by Dermatology and Neurology. By this time, I had just returned to work and I received the call that changed mine and Jacobs’s life in a big way. He was diagnosed with SWS. My heart dropped; I was so devastated. I had so many questions and concerns running through my mind. I had no clue how I was going to handle a work-life balance. After looking up his condition I felt it was a life sentence with no chance for a normal life. His first 3 years were very challenging. He had 7 pulsed dye laser surgeries done on his face to help remove the birthmark. Two sets of ear tubes (he had multiple ear infections), Adenoids and tonsils removed and he was hospitalized four times with seizures. He had to see various specialists including neurology, dermatology, ophthalmologist, otolaryngologist, gastrointestinal and cardiologist. At the same time, Jacob was also receiving various therapies such as occupational, physical, speech, and developmental therapy (eyes). In March of 2011, my life took another turn when I was laid off. I took the opportunity to go back to school and get my Master’s degree. I completed this program in 10 months. However, those 10 months were not easy; my son was hospitalized twice for seizures and diagnosed with a heart murmur and Bicuspid Aortic Valve. To add to the challenges I was facing at that time, my son’s father also decided to move to Arizona to pursue his career. Again, I was heartbroken, I did not know how I was going to handle all of this alone. I had completely lost myself. I did not like the person I had become. In 2012, I made the decision to become a Christian. I knew I could not continue this journey without Jesus. I finally landed a job in September 2012. I thought all my trials and tribulations were over. Boy, was I wrong. In April of 2013, the city of Chicago froze my bank account, my wages were garnished and my son’s dad was fighting me for custody. To make matters worse, in July 2013, my job did a massive lay off and I was one of them. In the middle of all this my son still had many doctors’ visits and weekly therapies. Even though I was going through all of these problems, I made a huge effort to make sure my son was not affected by any of it. My job as his mother was to provide him a stable and loving home. Jacob was and is still my motivation to wake up every morning and not crawl into a dark hole and forget about all my problems. I could honestly say that in the middle of my circumstances that the Lord gave me peace. He never left my side. In October 2013 the Lord blessed me with another job. Things were starting to look up. I had found a job that allowed me to have a work-life balance. The issues with the city and custody were resolved. A few years went by and my life was great. I had an amazing relationship with Jesus, I had accepted that I was a single mom, and Jacobs’s health was stable. I had a work-life balance. On September 30, 2016, my life took a turn again. I was laid off by my employer. I knew God had a plan for me because I was at peace about it. I did not expect, nor was I ready for the news I was about to receive two months after my getting laid off. Due to Jacobs’s conditions he has to be examined every year. During one of the visits to his Ophthalmologist, Jacobs’s doctor that he was seeing for a few years now, he told me that he was moving to a different state and referred me to see another doctor. (Back in 2015 Jacob was diagnosed with elevated pressure in his eyes -liquid build. They were giving him drops to control the pressure). I went to see her in November 2016. She examined him and told me he had glaucoma and he needed surgery. I was shocked because I had just been at the previous doctor’s office a month ago; he never mentioned glaucoma. The real journey came on December 14, 2016; it was surgery day. Jacobs’s dad and Godmother were at the hospital with me. We all received the news at the same time. Jacob had 80% optic nerve damage on the left eye and 70% optic nerve damage on the right side. His doctor told us we needed to prepare ourselves because he is going to go blind. My life came crumbling down. I could not stop crying. I remember driving Jacob home after the surgery and I was asking God if it is his will for Jacob to go blind please give me the strength and allow us to lead as normal life as possible. The next day we went back to the doctor and we received the news that we had to go back into surgery. His eye was rejecting the tube-shunt they placed in. I was crushed. I had no idea how I was going to explain to my son we had to go back into surgery. They needed to remove the tube and allow scar tissue to grow on the plate. He had his third surgery on February 8, 2017. They were going to put the tube back in his eye. I remember this day like it was yesterday. My son made me so proud. They were about to take him into surgery and he told the lady that he was not ready yet because he had to pray. His prayer was “I am healed in the name of Jesus." We were all crying and everything was a success. The surgery for the right eye was scheduled for March 2017. The day of surgery he was sick so they canceled the surgery. I started panicking. Remember, in December of 2016, he already had 70% optic nerve damage. It was becoming very difficult to control the pressure and every day that went by more optic nerve was being damaged. We finally got rescheduled for March 21, 2017. His doctor gave me the option of performing his surgery in parts or should we take the risk of putting the tube and hoping his eye won’t reject it. I told her to take the risk. We went to the doctor the next day, surely enough the eye was rejecting the tube. As I was in the doctor’s office with Jacob, I got a call that my mom was in the hospital. Again, I felt the world crumbling and I was torn between my mom and son. I wanted to be there for my mom, but my son needed me. At this point I knew I had to reach out to my praying community/friends to pray for Jacob, my mom and I. I was getting very weak and I was not sure how much more news I could endure. I just remember telling Jesus to please give me the strength to continue. I was praying over Jacob telling his body that he is healed. My trials and tribulations did not end. Five surgeries later and going to the doctor almost every week for 6 months, my unemployment was finished and I prayed “Okay God all I have is you. I will trust you.” In June 2017, my previous employer called me back to help them temporarily. Little did I know my child support was stopped due to an error made by the state. God knows all things because if I would not have come back to my previous employer, I would not have had any income. I knew that God was there with my son and me the entire time. I have seen God’s hand move in my life. I have been praying for a career and was recently blessed with a new job opportunity. This is just the beginning of what God has in store for Jacob and me. The reason why I share my story is because of the great lesson God taught me through it all. God blessed me with the greatest gift anyone could receive and that is being a mother to Jacob. In Hebrew his name means: Holder of the heel; sub planter; may God protect. Jacob has met all odds. He has endured and survived 16 surgeries all by the age of 8. He may have many of the traits and symptoms of a child with SWS, but he is the strongest, most courageous, amazing child I have ever known. He has taught me compassion, patience, sympathy, empathy and appreciation for the smallest things in life. All my life, I have been very strong and independent, but now I can add to it faith filled and courageous because Jacob is God’s daily miracle for me. He is proof that God exists. I have worked hard for everything in my life from an early age. I believe I have set realistic goals, and have met most of them already. But you are never really prepared for those extras that hit you unexpectedly. You just go with the flow and hope for the best. I know that many women who are raising their children alone never planned it that way. I know I didn’t, but it happened just the same. One major thing I have realized is that, without faith in God, my family, and the support of great friends, I know I could not have made it this far. Everything I do is because God gives me strength and Jacob gives me purpose.